Our two week stay here at the cabin outside the Rocky Mountain National Park ends tomorrow. 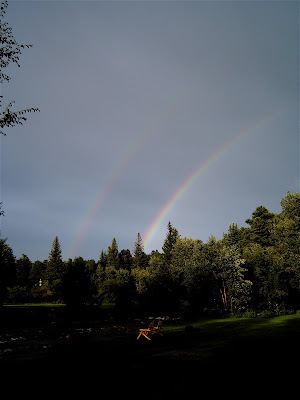 Last night we were treated to a double rainbow after an afternoon of badly needed rain. We have had the excitement of TWO encounters with bears. The first one appeared last Sunday mid-morning on our porch. We would've missed him except that Lee had gotten up from watching the British Open to adjust the TV and there he was on the other side of the screen door. By the time he called me and I got my camera functioning, the bear had already visited our neighbors porch and was on his way into the woods. 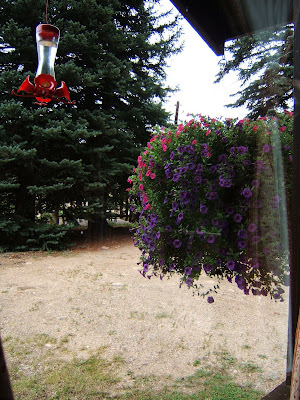 A much larger bear visited the other evening to drink the hummingbird's water from the feeder hanging from the eves outside our window. Lee heard a noise and felt the cabin vibrate with a big thump. 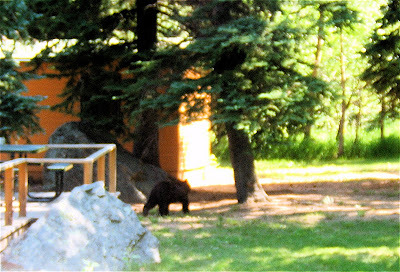 He turned on the porch light and threw open the curtains to see a large bear lumbering away and an empty feeder on the ground. 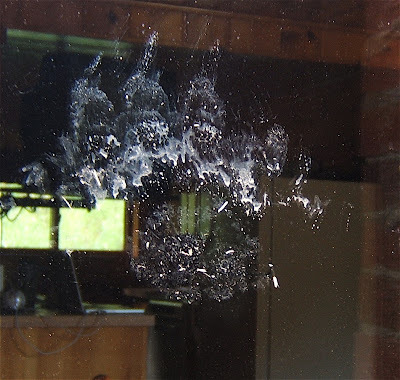 The next morning I discovered a souvenir left behind on the window pane ... two huge muddy paw prints. I've had enough bear encounters. 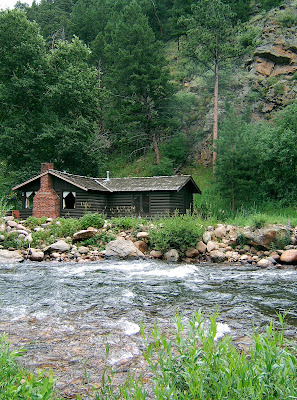 To read about my chasing one out this cabin a few years ago go here. 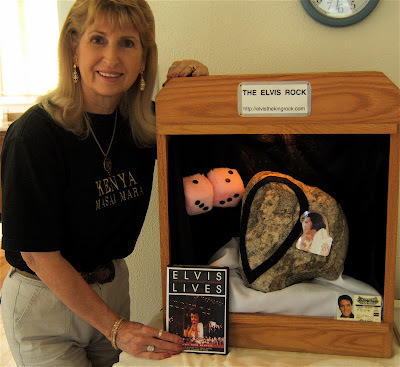 A big item in the news this past week is the Elvis Rock. 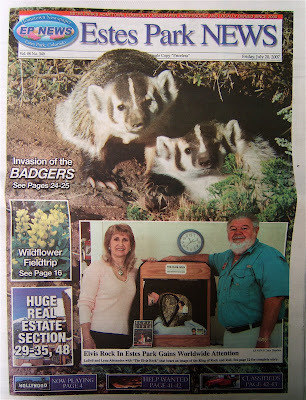 It's been featured in multi media nationally, internationally, as well as locally. ... a personal Presley Pilgimage. 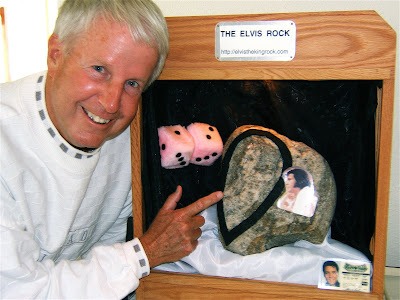 A local geologist claims the Elvis Rock is pre-Cambrian granite and estimated its age at over three billion years old. Lee says this proves that Elvis was actually born three billion, forty-two years ago. 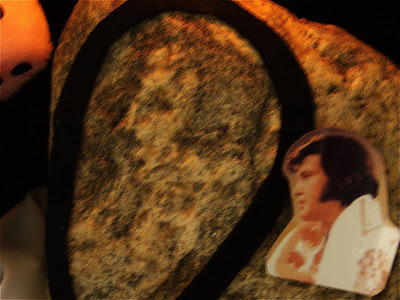 Graceland is celebrating the 30th anniversary of Elvis's demise at age 42 next month. Obviously, they are wrong. I have done a lot of rubbing and pounding here in Colorado. 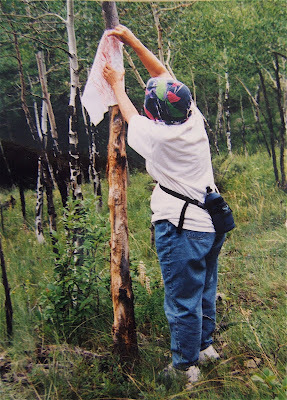 Whenever we take a hike I carry along a square of muslin and a crayon to make rubbings from interesting surfaces ... mostly trees and logs. The poundings are of flowers and leaves. 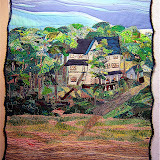 This one commemorates the area in which we stay. 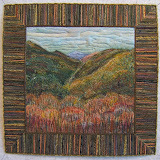 Memories of Rockmount - 12"x 12"
It has crayon rubbings of surfaces within our cabin and the top rail of the bridge leading to it. The pounded flowers and leaves were picked from the shoreline of the stream as well as the basket hanging outside the cabin. It was gifted to the retiring managers of the complex. I made two pieces from these rubbings and poundings that are similar to each other. Rubbings were painted to look like mountains. 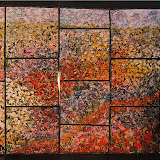 Each corner represents a time of day ... sunrise, noon, sunset, and night. 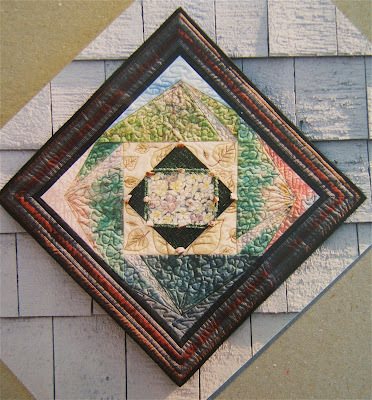 The first was made as a wedding present for my husband's cousin who was married in the mountains. 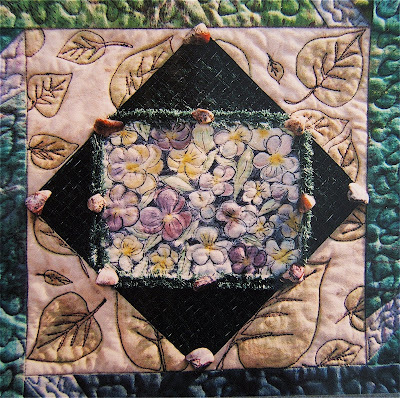 The center of this one features wild flowers which the bride carried in her bouquet. 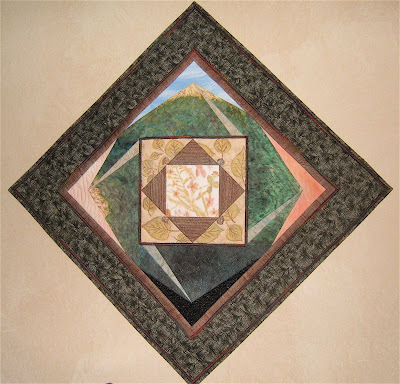 It also has small stones from one of the hiking trails couched with metallic thread to the four corners of the center. 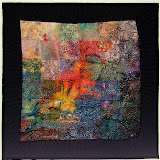 This one was presented to my brother-in-law who has a house in Aspen for his 70th birthday. 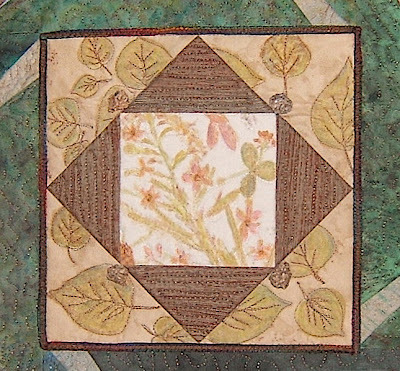 It's center features pansies from his garden and Aspen leaves from the trees in his yard. 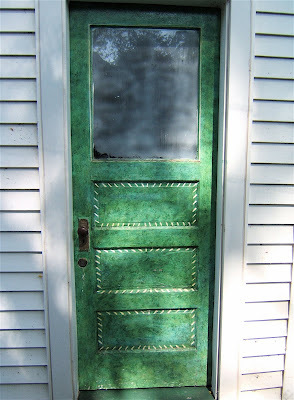 The stones are from his collection that have been found in the mountains and then polished. I took a small selection from the basket in the guest room, telling him he'd get them back. 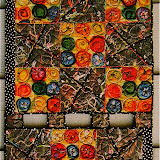 I had not treated the fabrics before pounding the flowers and leaves. 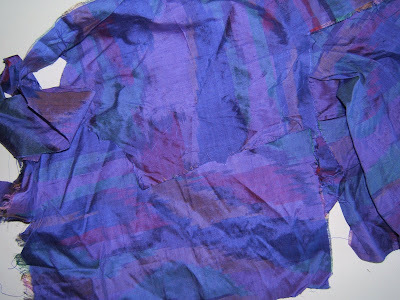 The natural dye is strong at first, but fades. 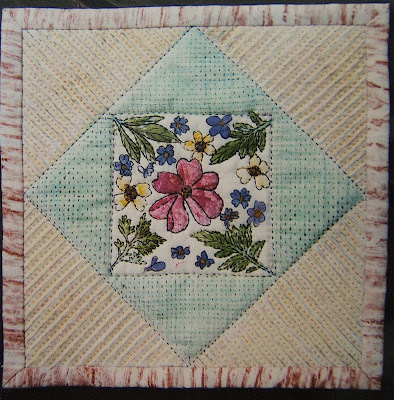 To ensure that the color lasts, I lightly colored the flowers and leaves with crayons and set the wax and pigment into the fabric with an iron. One of the last things we did before leaving the cottage for Colorado was to give this glider two coats of spar varnish. 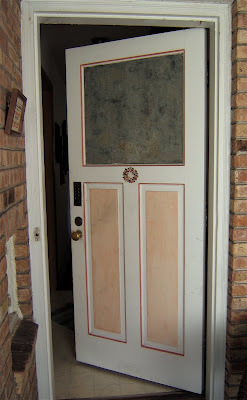 It was painted by our daughter-in-law and grandson. 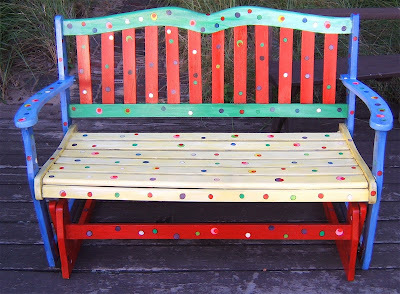 Her mother and I helped by adding the dots. In the photo below Terra and her mother are outlining those dots with permanent ink Sharpie pens. Throughout my posts I've mentioned my friend, Alicia. We're staying at her house on our way to Colorado. 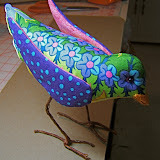 I got my camera out and have taken photos of her creative touches. 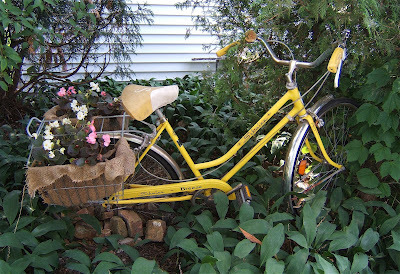 She couldn't bear to discard this old bright yellow bicycle. It's baskets became flower pots. It's "stuck" in her back garden by the garage entrance. 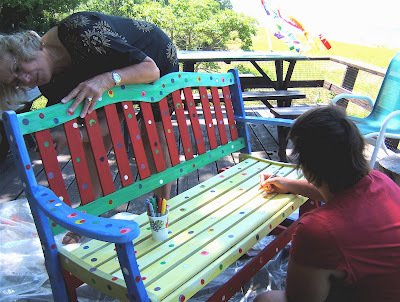 Alicia has helped me paint furniture at the cottage. 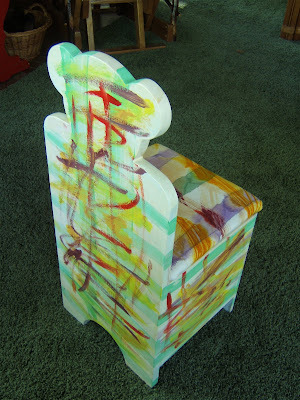 Over the years she's painted a number of chairs ... some of them for charity auctions. 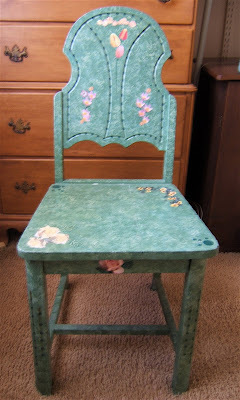 This one with decoupaged flowers is in her sewing room. 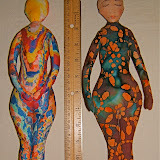 She combined hand-marbled paper with her painting on this ensemble in her front hall. 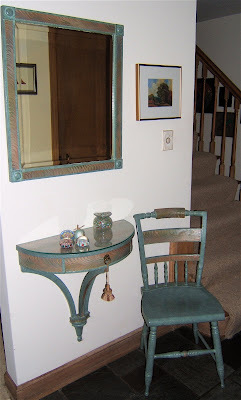 This painted table and mirror are in the guest bedroom. I had given her this clothing butler when I moved from Milwaukee. Now I wish it were mine even though I still would not have room for it in Tennessee. I do get to use it when I visit. 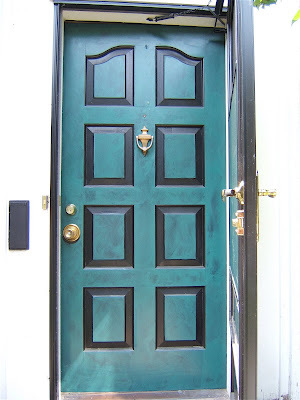 A few years ago she decided to spruce up all her outside doors. Alicia is a very talented lady. 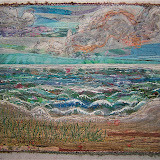 Here's a second postcard that has slipped into the Lake Series. 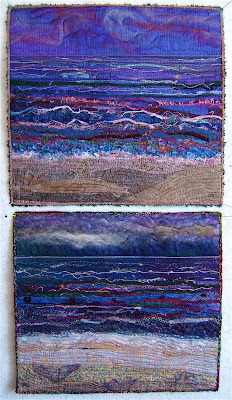 The sky and horizon of the lake are the purple Thai silk fabric mentioned in my last post. 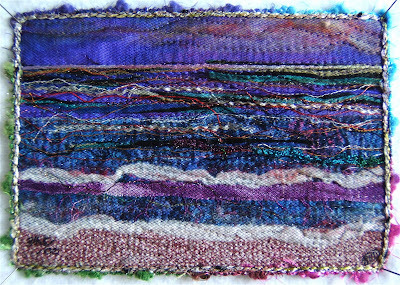 Lake #34.5 - 4"x 6"
It's created for Dianna in exchange for one of her "Turtle Soup" postcards she made from the leftovers of "Honu II". See them here. Basically, she and I are trading scraps. What fun! I can hardly wait to receive mine from her. 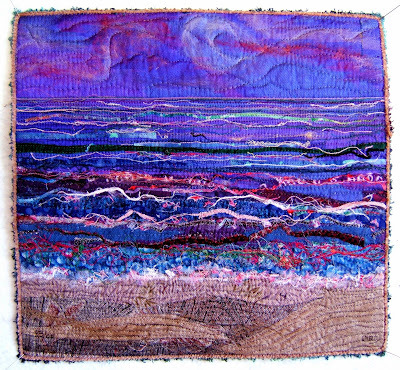 I'm not sure of the time or conditions that this purple lake piece represents. One of my sisters-in-law sent a bag of scraps. One piece was this purple Thai silk. 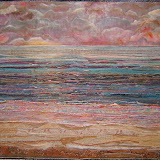 I could hardly wait to make that Lake quilt. 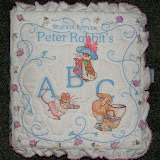 There will be more pieces that use this silk. 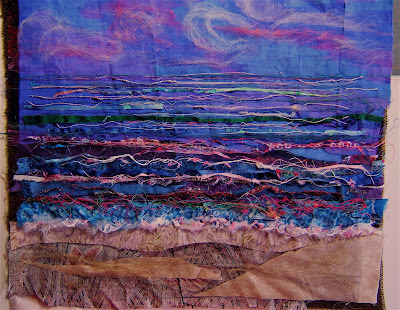 I plan to let the fabric speak more for itself in those. 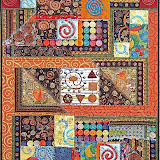 Here's the piece under construction ... before the quilting. Here are both purple pieces. The new one and ... #28, the one that represents a moonlit night. Our three grandsons are the same age. 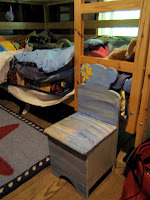 Their third summer I bought each of them a cute teddy bear chair for their bedroom here at the cottage. At the end of last summer Jennings rebelled against having a "baby chair" and declared he was throwing it out. I called him into my bedroom for a little chat. I asked him if he used the storage area in this chair and if it was at all useful for getting up to the top bunk where he sleeps. Then I suggested we make it into a big boy chair. 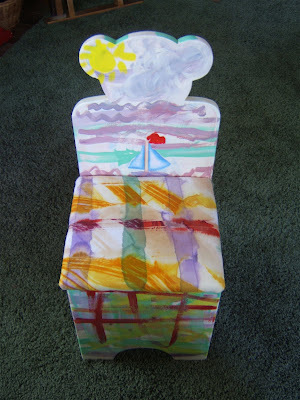 He chose a fabric that looks like the lake and the sky to cover the seat and then painted his chair to coordinate. 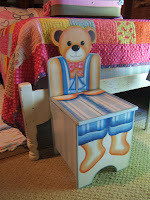 This week Jackson refinished his bear chair. His choice of fabric surprised me. 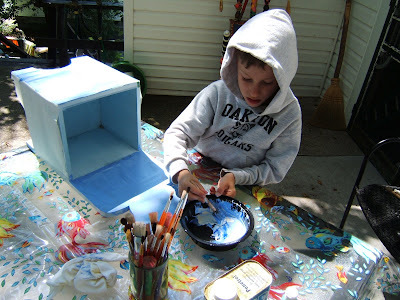 While he was painting, he was making rap music noises and slinging his brush to the beat. It could not have turned out more perfectly. The only thing left to do is reattach the hinges for the covered and padded seat. Winston has given his chair to his 5 year old sister. She's looking forward to making her art chair in August.